There are some people you always want to learn football from, especially when they understand the game so well and played college football. Guest analyst Justin Samples is one of those people, and he has written many acclaimed opinion/analysis articles at FishDuck.com. I thought I would check-in with him concerning his thoughts about the team after the first two non-conference games. Do you agree with his views? Justin: Hands down the discipline of the team. I read the same “coach speak” as everyone else, and the cynic in me said, “Yep, heard that before.” However, what I have seen so far is night and day. The most surprising thing to me is that they’ve essentially eliminated those penalties while still playing at breakneck speed. Usually you would anticipate some amount of fall-off. However, that hasn’t been the case. That is a testament to an attention to detail by the entire staff, which we haven’t seen in some time. Justin: The receivers. No question. The receivers. Strong teams are going to load the box, play man, and dare us to beat them with superior wide receiver play. In order for us to make teams pay for that, we need receivers that can beat them with speed, precision routes and hands. While I think we have some speed, I haven’t seen the route running or catching ability necessary to make teams pay. If Bowling Green and Portland State are staying in our receivers hip pocket, then there is little chance they are going to make UW and Stanford pay the price for man coverage. That in turn is going to put a ton of pressure on Justin Herbert and our offensive line. 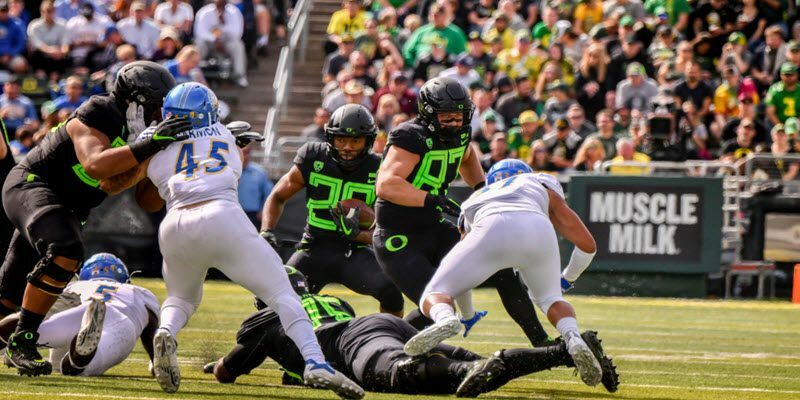 If our offensive line can pick up initial pressure and Herbert can make plays with his feet, that should force teams into zone defenses and open up some opportunities for our receivers. Now, can they consistently catch the ball? What is progressing that others were concerned about, but you knew would be fine? Justin: I heard a lot of concern about starting a true freshman at left offensive tackle and the potential for getting confused by complex pass rushes. So far, so good, and while the competition hasn’t exactly been stiff, he has shown he is Division-One ready. By mid season, that left side of the line will be a nightmare for opposing defensive lineman. Justin: I expect to see the o-line get dominant by mid season, assuming we stay healthy. I also think the defense is going to get sneaky good around then as well. Some of freshman have been stunning so far. Jevon Holland is a missile that might become the best safety we’ve ever had. Adrian Jackson showed me a ton against Portland State, such as speed off the edge, the power to push the pocket and technique to beat reach blocks and contain the edge. 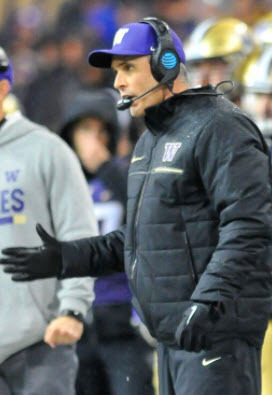 Chris Petersen is not as scary this year? Justin: Assuming Herbert stays healthy, this team will be deadly good mid season and should close out very well. However, I just don’t think we are ready for Stanford, and they are a bad match-up for us. They are well-suited to our strengths and their strengths match-up perfectly with our weaknesses. For some reason, I have confidence in the game against Washington. We have a bye week leading into it to ensure we are healthy, and they’ll be coming into Autzen on back-to-back road trips. The Husky offensive line hasn’t demonstrated an ability to enforce their will on anyone, and their WR core is nothing to write home about. That plays perfectly to our strengths and weaknesses on defense. The key, as I said earlier, is going to be if our o-line can stop their initial pressure, and if Herbert can make enough plays with his legs to force them out of man coverage. If we can do that, I think we get that game at home and could very well end up winning the North. The only thing worse than watching the running game of our current team at Autzen was watching it again on replay. Count your blessings that you are not required to do an analysis of it. Today is an opinion piece and I will get into the strengths and weaknesses in future articles of our Pistol offense and challenges presented. Could my reactions be an example of the typical emotional highs-and-lows of a fan? I don’t deny that, as later I could feel embarrassed by this post. And I share with you my list of concerns knowing I do have to give the new coaching staff a chance to perform. 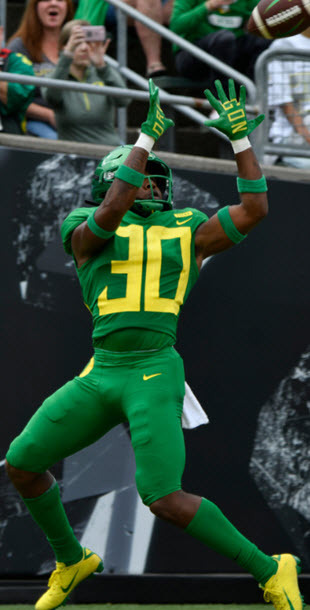 But compared to the Oregon offenses of the past…this is a massive step down in the running game at Oregon. We have receivers who are not consistently catching the ball. The amount of touchdowns dropped already this year alone would win a game. We have poor run blocking against three weak opponents, and we have an experienced offensive line? We have running backs mis-reading the blocks and cutting away from open space. An offensive lineman put in an impossible position. We have no threat with the “read-key defenders” as they know we don’t want to run Herbert, so they charge the running back every time and often get him stopped for short gains as a result. We have offensive linemen put in a bad position to make “seal” blocks that they can’t complete, instead of using the offensive lineman who does have the angle. Even a shield block that critics savaged Steve Greatwood and CK/MH/SF for would be a hell-of-a-lot better than what I saw in the last 24 hours. We have no lateral running game at all, as perimeter runs and cut-back lanes are as rare as seeing an old Outside Zone Read again. Braxton Burmeister got hurt and is out a few weeks from an injury. I wonder if it came from a play I featured last week where I did not like how hard and many times he was getting hit? He ran inside when the outside was open–twice. But worst of all we do not have a system we know works. 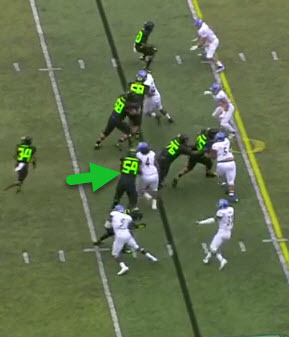 Chip had a system, a counter-to-every-counter and Helfrich continued with that. We just have a collection of plays right now without a “system” that makes teams great by execution and by belief from the players. 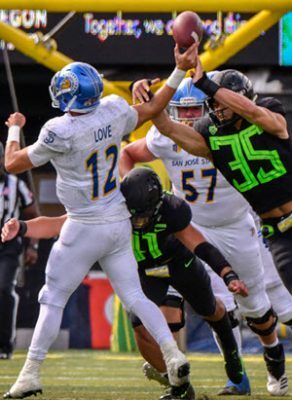 Justin Hollins and Troy Dye excel in Jim Leavitt’s defense. This offense is a mess. I never thought I’d see the day of 134 net yards rushing against San Jose State, who just lost to WSU 31-0. This is after leading the conference in rushing for a decade? Meanwhile on the defensive side we continue to improve as Jim Leavitt does have a system and knows what he wants and what he is doing. The star players are being put in a position to succeed and flourish! I feel like I will need to wear a helmet to the Stanford game to prepare for the shelling, as this is the worst match-up at the worst time possible. It is so disappointing after studying the Oregon offense for seven years and having a library of over 350 analyses. No, it is depressing. But I am a loyal Oregon fan…time to be tested as one! Remember our rules for commenting; “no insults, no name-calling, no belittling and even a back-handed compliment will be deleted.” Do it twice and you will be blacklisted from ever commenting here again. State your position with facts or a logical line of reasoning and be polite to fellow readers who comment, as FishDuck.com is the only safe Oregon site for all to comment without the trolls.